A charming four-bedroom detached home, in the desirable location of Warwick Gates. This delightful family home has been lovingly maintained, with lots of natural light throughout and is waiting for its next owners to make it their own. On entering the home through the entrance hallway doors lead off to the dining room, sitting room, kitchen and downstairs W/C. The dining room is a perfect setting to entertain guests overlooking the front of the property, with a large bay window allowing plenty of light to flood the room. The living room is located at the rear of the home; this spacious room is filled with natural light owning to the south facing garden and large windows and double doors leading out into the rear garden. The large kitchen is located at the rear of the property and is fitted with an abundance of wall and base units as well as plenty of work top space making it a baker’s dream. The kitchen is also a perfect size to host a breakfast table with still having plenty of room, the large windows overlooking the rear garden make this room an enjoyable place to cook as well as having side access into the garden. A handy under the stair’s cupboard and access into the integral garage with the potential to extend if desired. On the first floor is a spacious landing, family bathroom and four bedrooms. The master bedroom overlooks the front of the property, this is a generous sized double room benefiting with full wall length built in wardrobes and a fully fitted en suit. The second bedroom is a double room, overlooking the rear garden and also having the benefit of built in wardrobes. The third bedroom is the larger of the two single rooms and also benefits from built in wardrobes. 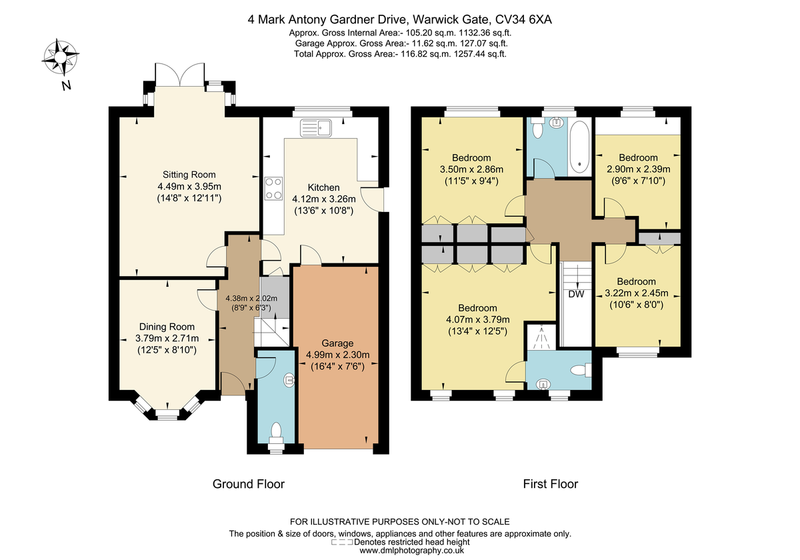 The fourth bedroom overlooks the rear garden and makes an ideal nursery or home office. The family bathroom is a fully fitted suite, with bath and shower over the bath. On the first floor you will also find the airing cupboard that offers convenient storage space. The front of the property offers drive way parking for two cars, a single garage and features an attractive front garden. The rear garden is a gardeners dream and creates the ideal space for al fresco dining being a desirable south facing garden. The fully enclosed rear garden is mainly laid to lawn, as well as mature shrub boarders. DISCLAIMER It is our intention to ensure that the information on these particulars are as accurate as possible. However, please be aware that in some instances the information hasn’t been available. Therefore, it is advisable to contact the office prior to viewing the property especially if there is something that requires clarity and we will be happy to confirm with the vendors. It is recommended that all the information provided is verified by an independent conveyancer. Photography is a representation of the property for visual purposes only. Viewing – Strictly by appointment only with the appointed agents Inside Homes.